Hon. 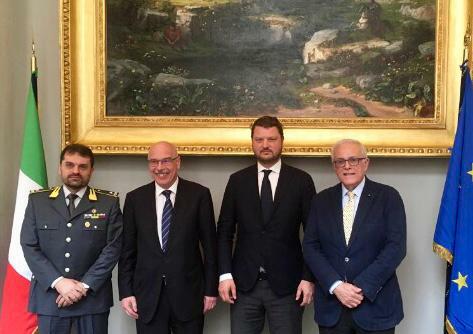 Gennaro Migliore (Italy), Chair of the PAM Parliamentary Committee on Terrorism and Rapporteur on Terrorism, together with Sen. Francesco Amoruso, PAM President Emeritus, met in Rome on 27 March 2019, the United Nations Under-Secretary-General of the Office for Counter Terrorism (UN OCT), Amb. Vladimir Voronkov, on the occasion of his official visit to the Italian Parliament. The PAM representatives reviewed with Amb. Voronkov the ongoing cooperation between PAM and the UN OCT, and emphasized the need identified by the Assembly for reinforced international cooperation on counter-terrorism. Amb. Voronkov referred to the importance of the parliamentary dimension, to which PAM offers its valuable contribution by gathering together the Parliaments of the Euro-Mediterranean area to address the legislative aspects of the global counter-terrorism strategy on a regional level. The lack of a universally accepted definition of terrorism is still a barrier to overcome effectively the fight against terrorism. It was noted that PAM has already adopted a definition of terrorism by consensus in 2008, which has also been used, as a reference, by the United Nations, and which had paved the way to the unique partnership between PAM and the UN Security Council CTED. Amb. Voronkov stressed the importance of implementing UN Security Council Resolution 2178 (2014) into national laws, a point which was also strongly emphasized in the latest PAM Resolution unanimously adopted at its 13th Plenary Session in Belgrade last February. PAM has always enjoyed a close cooperation with the United Nations on counter-terrorism, playing a crucial role to promote the harmonization of national legislations, which facilitates international cooperation to track, capture and prosecute terrorists, including returning or relocating terrorist foreign fighters.